EZ-CARE2 Web Solution - Says Connected anytime, Anywhere! Have you ever wanted to access your EZ-CARE system from home, while on vacation, or at a remote site? What about centralizing data for multiple sites while allowing each site to access and work with their own data. Now you can without having to install and manage your own remote access infrastructure! We are now offering to host your EZ-CARE system on our secure servers and all you need is a broadband Internet connection. With our subscription-based pricing model, you’ll have a cost effective solution. The pricing is per-user based and can be setup as a monthly or annual fee (free 13th month). In addition to the standard user/access security provided by EZ-CARE2 Web, your data will be protected at our professionally managed hosting site. This includes automatic server backups, backup power, software/data secure partitioning, and facility security. As with all computer technology, your performance will be influenced by a variety of factors including the speed of your computer, the amount of data, and the type of operation being performed. Since you will be accessing the software via the Internet, the most critical factor affecting performance will be the speed of your Internet access. Performance should be reasonable for anyone with a broadband (DSL, Cable, Satellite, etc.) connection, but can vary depending on a variety of factors we can’t predict, including Internet congestion and number of users simultaneously accessing the server. The good news is that all software functions are run on our server, so only keystrokes, mouse-clicks and screen changes need to be transmitted. Can I do this only for remote users? 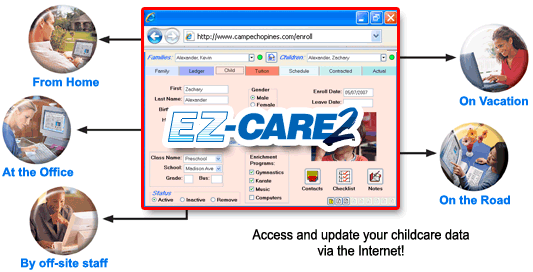 In order to have remote users working with the same data, you will need to be using EZ-CARE2 Web for all users. Can I host EZ-CARE2 myself? Yes, if your organization has a sufficient number of users and the technical resources to setup a server and remote access software (such as Citrix or Terminal Services) you can host EZ-CARE2 Web yourself. The advantage that our hosting service offers is that by using a shared hosting infrastructure, a cost-effective hosted version can be made available to centers with just a few users. In addition, all of the IT infrastructure and costs are included in the monthly fee.